This post is a follow-up to one of my most popular posts: The 20-dollar 20-day Emergency Food Kit. In that post, I detailed my cheapest-possible entry-level stored food kit. The kit had only 5 food items (pasta, rice, legumes, sugar, oil), all of which store well. For about $1/day, you get about 2500 kilocalories and sufficient amounts of carbs, protein, and fat. This new version of the food kit is more expensive, at about $1.67/day. But the variety of foods is greater, with 10 items instead of 5, and the protein and caloric content is higher at about 2800 kcal/day. Of course, you don’t have to eat that many calories per day. It is simply the total amount of calories available. But when the SHTF, you might find that you need to be more physically active, to deal with whatever disaster is at hand, and so you will need more calories. See the full-sized version of this spreadsheet for the $50 30-day food kit here. All of the foods in the $50 30-day food kit store well, with the exception of whole raw eggs. However, raw eggs will keep in the refrigerator (35 to 40 degrees F, sealed container) for up to 7 months, according to tests done by Mother Earth News. You could keep at least a couple of dozen eggs on hand in the refrigerator, and rotate in new eggs as you use up the old ones. Alternately, you can buy 2 lbs of egg whites for about $5 (less for an off-brand) and store in the freezer. If you are on a budget and want to store good sources of protein in your freezer, the above are all good choices. The cheese, bologna, and hot dogs do not need to be cooked. So if the power goes out and the food in your freezer thaws, they can be eaten without cooking. The prices of the items in the food kit will vary. The prices listed are as of this writing and not guaranteed. Your prices will vary. For the pasta, I used the sale price common at a local supermarket here: $10 for 10 lbs of pasta. They have that sale about once a month, and it’s a brand name of pasta. You could also get pasta on the cheap at one of those warehouse club stores (BJ’s, Sam’s, Costco) or by choosing a store-brand. Pasta is a good source of both carbs and protein, and it keeps well in storage. The flour price was for a store-brand, but the name brand was only 10 cents more per 5-lbs. So you could get the name brand all-purpose flour and still be under $50. The flour and yeast on the food list are for making your own bread. The cost savings are significant, and the quality of the bread (with a little practice) is much better than many store-bought breads. Flour keeps well as long as it is kept cool and dry. Use a sealed container, and pour 8 oz of salt into the container, under the package of flour, to absorb moisture. I chose parboiled rice because it has a higher protein content than white rice. The 10-lb package was only $8.99 at my local market (which is not known for low prices). If you choose brown rice, you get even more protein. But the fiber content of brown rice might be too high if you eating it in large quantities. Canola oil has both essential fatty acids (omega-6 and omega-3) in the right proportions. Oil keeps well and provides fat, which is an essential nutrient. Low-fat and fat-free foods are not what you want in a survival situation. You need calories, and some of those calories need to be from fat. The average American diet is too high in fat at about 100 calories of fat per day and about 30 to 35% of total daily calories from fat. This food kit is not low-fat, but it has only 26% of kcal from fat and only 76 grams per day. The butter is in the kit to make the food more palatable. Butter keeps well in the freezer, and it makes almost any food taste better. The one pound of butter should last you for 30 days, if you use an average of 1 tablespoon per day (32 tablespoons per pound of butter). It also goes well with homemade bread. I priced the butter at $3.79 per pound (which seemed high to me) because that was the price at the local market. You might do better with an off-brand or a sale or a club store. You could also substitute mayo for the butter (or for half the butter), if you prefer. The peanut butter was priced at $2.99 for 18 oz of a brand-name product. If you buy in bulk, you might reduce that to as little as $2 (according to my online research of warehouse club store prices). An off-brand of peanut butter does not save you much money. Is it just me, or has peanut butter jumped in price lately? That amount of peanut butter allows for about 3.7 tablespoons per week. That’s enough for a couple of slices of toast or one PB sandwich. I could have included more PB in the kit; it is a cheap source of protein at just over 2.3 cents per gram of protein. But legumes are an even cheaper source of protein at about one cent per gram of protein. I used lentils to calculate the nutritional content of the dried legumes. But you can substitute any dried beans, dried peas, or dried chickpeas. These are all good sources of stored protein. The price of dried legumes varies quite a bit. On the low end, I found dried beans and dried peas in the range of $0.95 to $1.19 per pound. I used $1.09 for the price in the kit (times 4 lbs). The sugar is priced based on a 4-lb package. If you use an average of 5 tablespoons of sugar a day, the total is about 4 lbs per month. Sugar can be added to the bread recipe, or you can add it to pasta (with some oil) or to rice. The $50 30-day kit is higher in protein than the $20 20-day kit. The latter has 52 grams of protein per day, and the former has 73 grams of protein per day. US RDA for protein is 46 g/day for adult women and 56 g/day for adult men. But most Americans eat closer to 100 grams of protein per day. The value of 73 g/day is more than sufficient. When a diet is based mainly on grains, such as wheat and rice, the total protein should be sufficient for good health. However, the amount of lysine in that protein becomes an issue. Most grains are somewhat deficient in the essential amino acid lysine. To increase the lysine content of this food kit, I chose whole eggs and dried legumes. Another good sources of lysine is soynuts. They store well and are an enjoyable snack food (but are somewhat pricy). The kit provides 85% of the ideal amount of lysine, based on the Institute of Medicine’s recommendations on essential amino acids (5.1% of total protein as lysine). But it provides more than 95% of the recommended amount of lysine, based on the U.N.’s Food and Agriculture Organization standards (4.5% of total protein). So that 85% value is more than sufficient. Originally, I had thought to include potatoes in the food kit. Potatoes seem inexpensive when you consider the cost per unit weight: 5 lbs for just a few dollars. But the amount of calories and protein that you get in those 5 lbs is surprisingly low: only 360 kcal and 9.7 g of protein per lb. That’s useful as a diet food, but not enough nutrition per dollar for prepping and survival purposes. Keep in mind that this kit is presented as an “emergency food kit”. It contains enough protein, fat, and carbohydrates for survival and good health, but it does NOT contain enough vitamins and minerals. I suggest storing a vitamin and mineral supplement. I also suggest that you have a small garden to provide some fruits and vegetables. This kit was designed as a way to provide protein, fat, and carbohydrates in case a short-term disaster prevents you from buying food at the local supermarket. I assumed, in designing the kit, that you have some food in your kitchen to use along with the kit: some canned fruits and vegetables, some frozen vegetables, condiments, spices, vinegar, etc. These food items will not contribute much in the way of protein, fat, and carbohydrates, but they make the food taste better and increase the vitamin, mineral, and fiber content of your meals. In addition to whatever food you store for prepping purposes (in a basement, for example), you should keep your freezer, refrigerator, and pantry well-stocked. 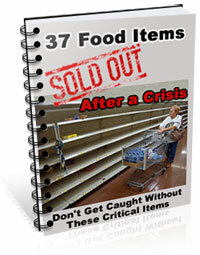 This will help you through short-term food-related SHTF scenarios with a greater variety of food choices. Which disasters might disrupt or interrupt the food supply? That is the subject of my next post. Stay tuned. Written by: Thoreau on April 17, 2015.